There is now a 4 die <b>PennyPressProfits</b> machine at this location, it replaces the single die Eurolink machine that was removed in 2009. 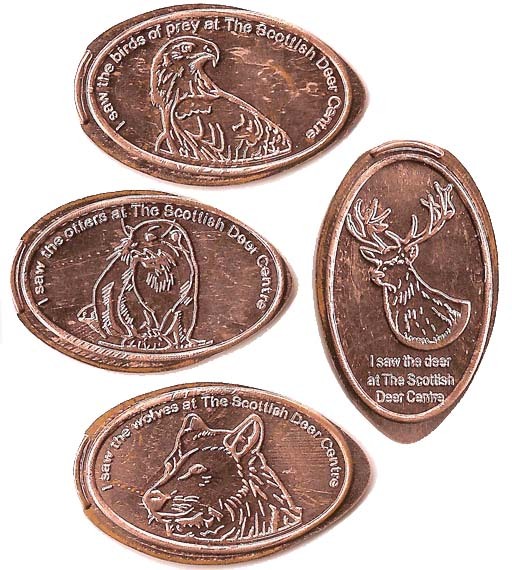 The new machine requires £1 per design<p> <b>Machine 2 designs</b>: Each have a text message and a solid ring border<br> 1) (h) I Saw the Birds of Prey at The Scottish Deer Centre, img of Falcon...<br> 2) (h) I Saw the Wolves at The Scottish Deer Centre, img of Wolf...<br> 3) (h) I Saw the Otters at The Scottish Deer Centre, img of Otter...<br> 4) (v) I Saw the Deer at The Scottish Deer Centre, img of Deer...<p> There has been a 4 die machine in place over the festive period, this had festive designs. No details are known, but hopefully it will return each year. <p> <b>Retired machine</b><p> A single die Eurolink machine was removed in 2009. 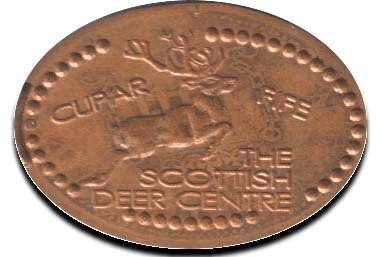 <br> The design was a leaping Stag, The Scottish Deer Centre, Cupar, Fife in text and a dotted border. There has been a 4 die machine in place over the festive period, this had festive designs. No details are known, but hopefully it will return each year. A single die Eurolink machine was removed in 2009. The design was a leaping Stag, The Scottish Deer Centre, Cupar, Fife in text and a dotted border.